All that's missing is a little heart. Before he became a rap artist. George and Karl! 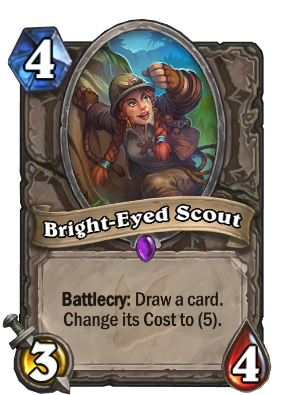 Thank the Light we found you! 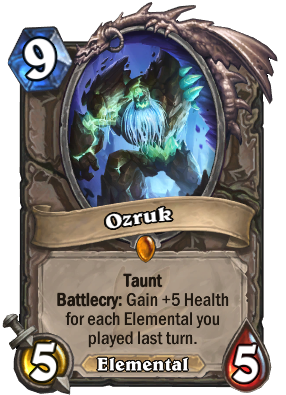 Battlecry: If you played an Elemental last turn, deal 5 damage. 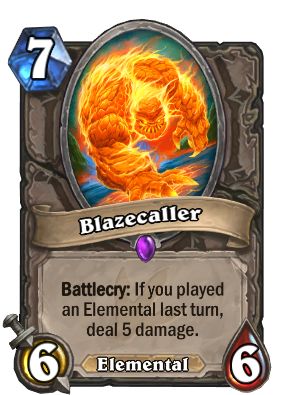 For when a flamecaller just won't do. 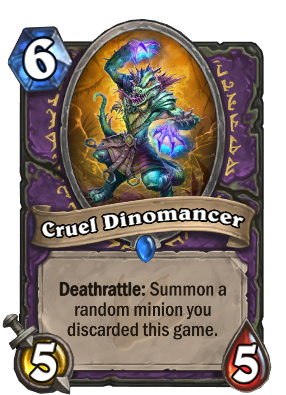 Deathrattle: Summon a minion from your hand with 5 or more Attack. Must be something it ate. 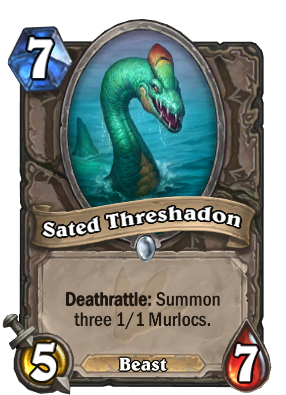 Deathrattle: Summon three 1/1 Murlocs. 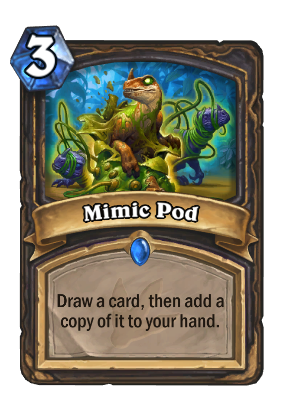 Bet you can't eat just one murloc! 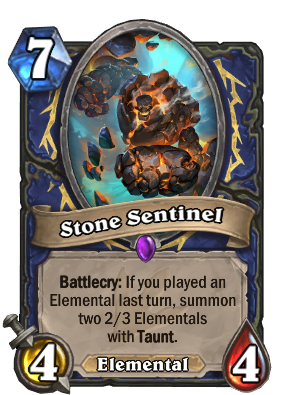 Battlecry: If you played an Elemental last turn, summon two 2/3 Elementals with Taunt. He and his friends just want to rock out. 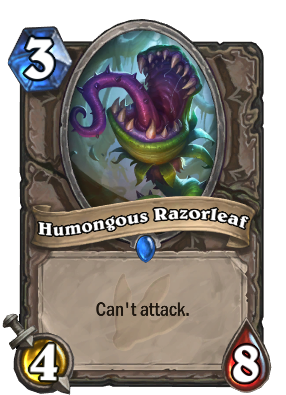 After your opponent plays a minion, attack it. 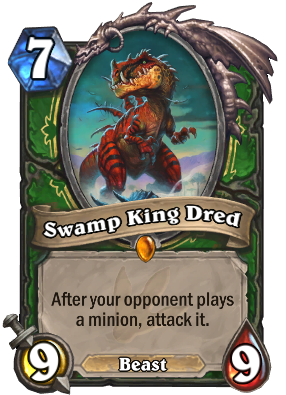 Swamp King Dred, more like Swamp King Dead, amiright? 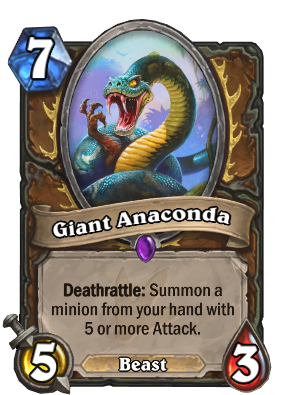 Has +4 Attack during your opponent’s turn. 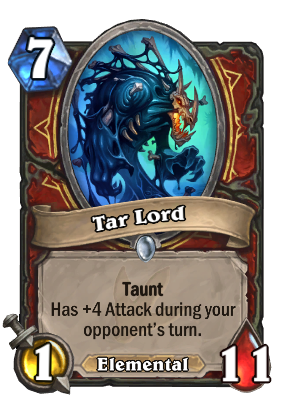 Tar Lord, man... legendary monster? Aw, forget it. 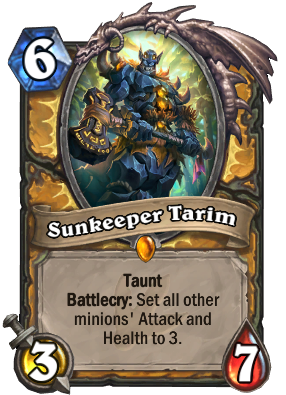 Give a minion +2/+6 and Taunt. 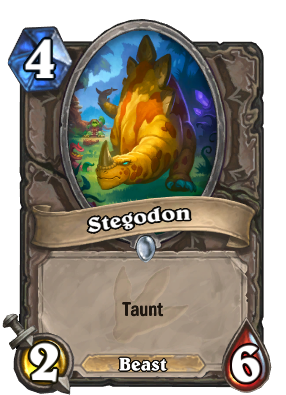 When it dies, summon a Stegodon. 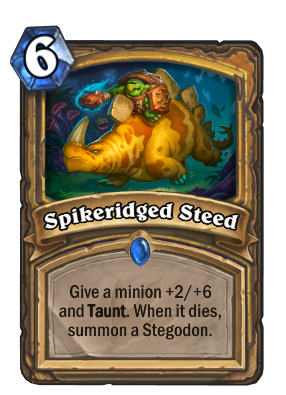 What beats cavalry? 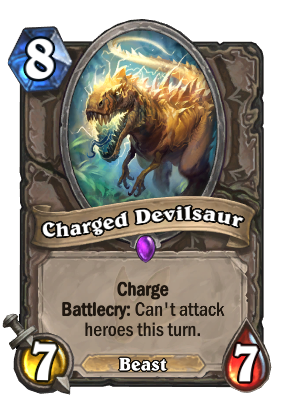 Dinosaur cavalry. 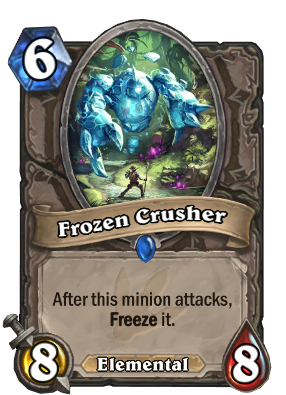 After this minion attacks, Freeze it. Goes by the online handle "KoolKrusher99." 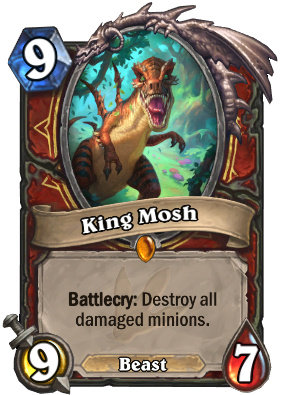 Battlecry: Destroy all cards in your deck that cost (3) or less. It's gotten a bit long in the tooth. 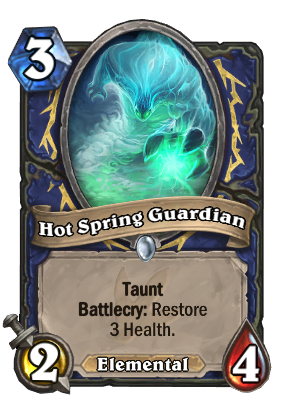 Battlecry: Set all other minions' Attack and Health to 3. 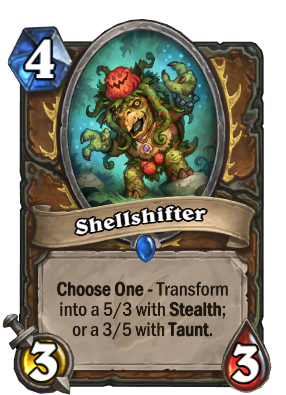 Ironically, his favorite number is 4. 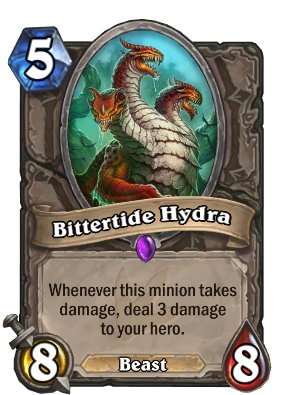 Deal 3 damage to a minion. 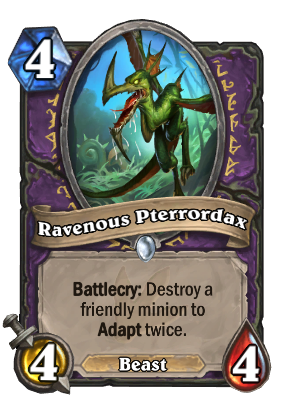 Summon three 1/1 Pterrordaxes. 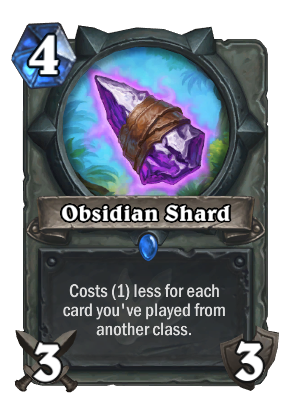 True, they're only 1/1s, but they eat as much as most 4/4s! 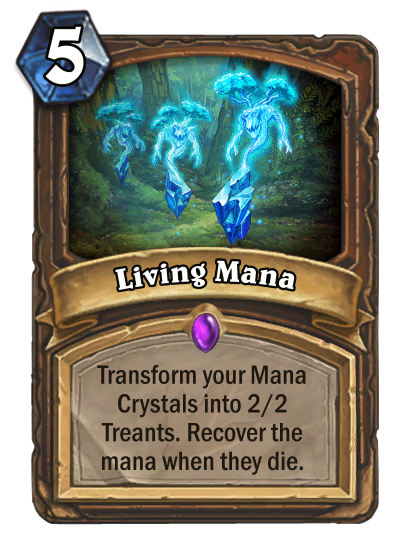 Transform your Mana Crystals into 2/2 Treants. 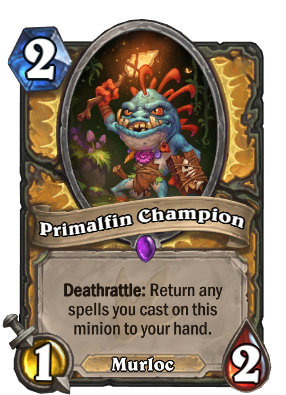 Recover the mana when they die. 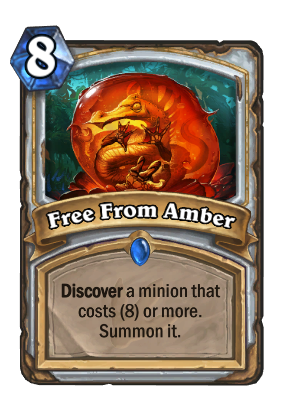 If you truly love your mana, set it free. 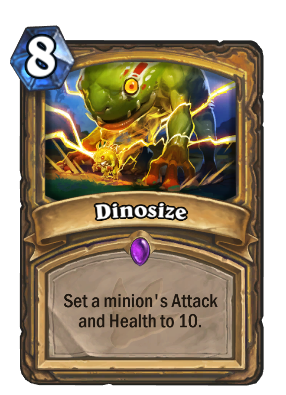 Deal 15 damage randomly split among all minions. 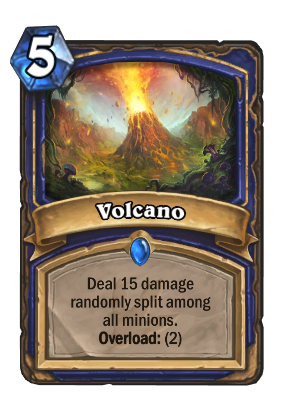 Many young shaman summon a volcano as their first school project. 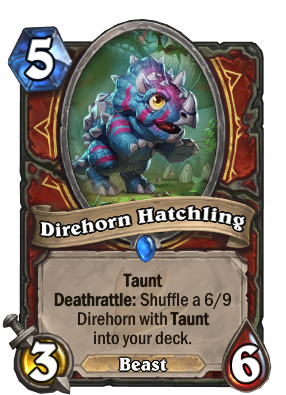 Deathrattle: Shuffle a 6/9 Direhorn with Taunt into your deck. His mom could beat up your mom. 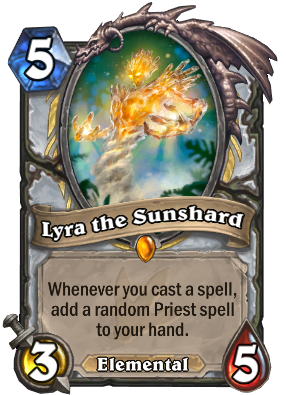 Whenever you cast a spell, add a random Priest spell to your hand. Arise, fair sun, and kill my envious foes. 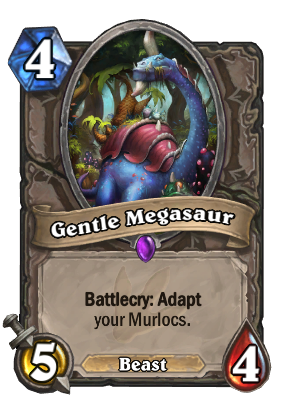 They don't have a legendary as beautiful as you. 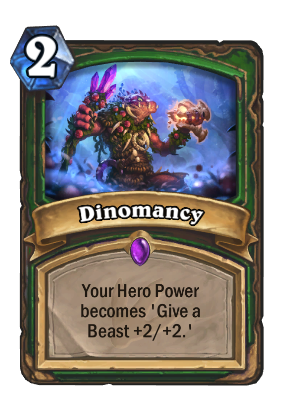 Battlecry: If you control at least 2 other minions, gain Taunt. 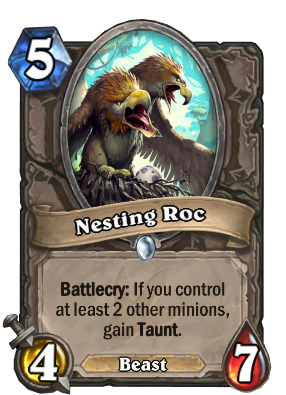 Roc eggs are great in omelettes, sandwiches, and as bait to turn poachers into bird food. 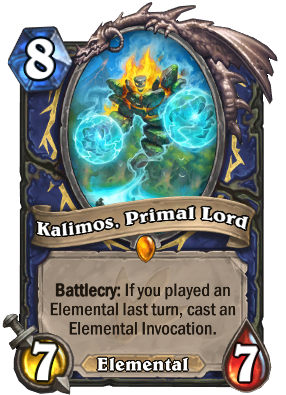 He's doing his best, but his mom thinks that if he had just applied himself in school Kalimos would be working for HIM. 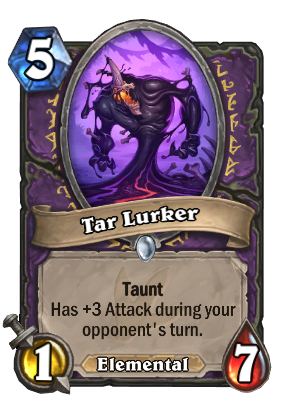 Has +3 Attack during your opponent's turn. 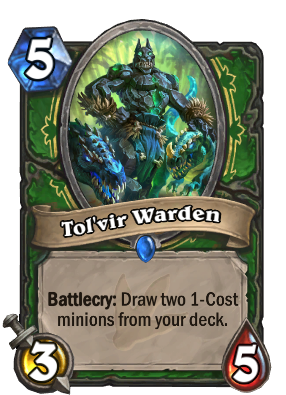 Battlecry: Draw two 1-Cost minions from your deck. 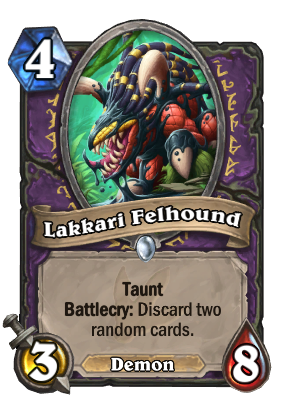 Ferocious in combat… and even more terrifying in pet battles. Always sticking its neck into other people’s business. 'Cause slayers gonna slay, slay, slay, slay, slay. 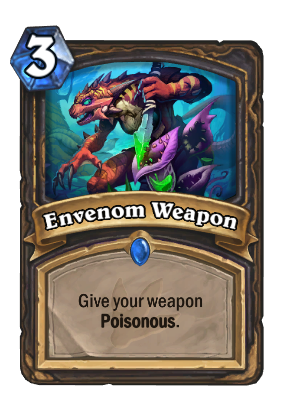 The most powerful mushrooms are commonly found in boxes marked with "?". Choose a friendly minion. 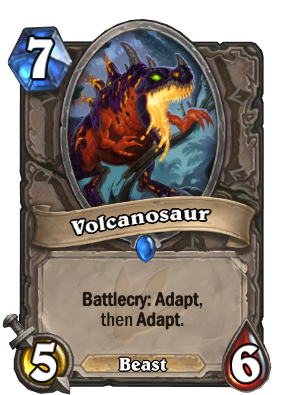 Summon a copy of it. Dang, I'm looking pretty hot! 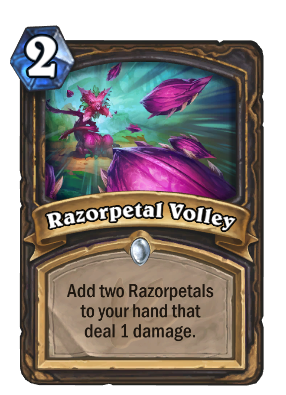 Deal 4 damage to a minion. 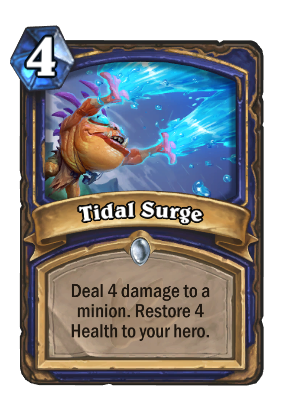 Restore 4 Health to your hero. Also good for removing pesky stains. 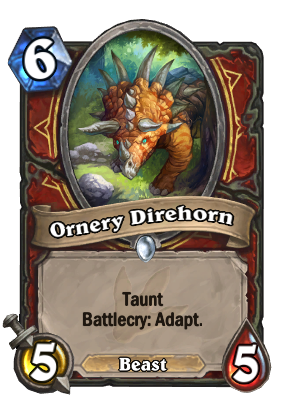 Battlecry: Draw a card. 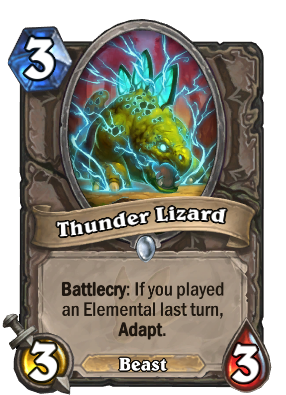 Change its Cost to (5). Also inordinately excited for cupcakes. 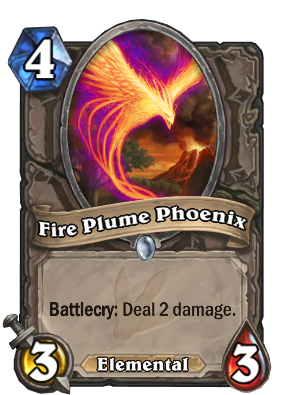 This is what happens when you use a volcano as a bird bath. "Low, low rents! Must enjoy a nomadic lifestyle. 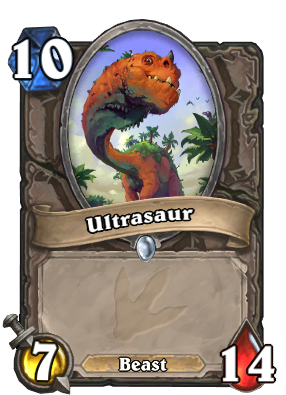 Quasi-sentient, bipedal, amphibious humanoids ONLY!" 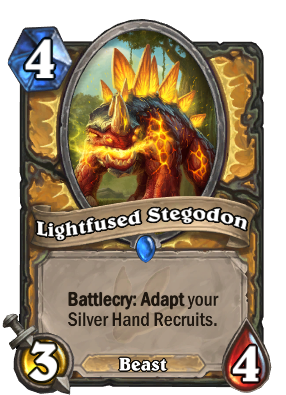 Battlecry: Adapt your Silver Hand Recruits. 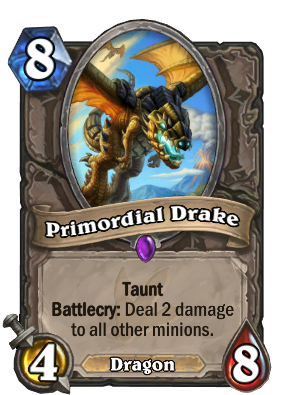 Battlecry: Destroy a friendly minion to Adapt twice. 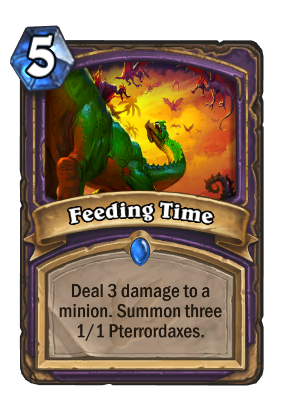 For better results, feed your pterrordax low-fat, high-fiber minions. 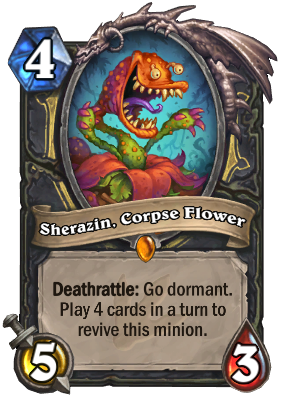 Deathrattle: Go dormant. 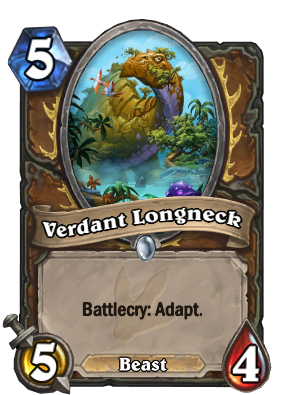 Play 4 cards in a turn to revive this minion. 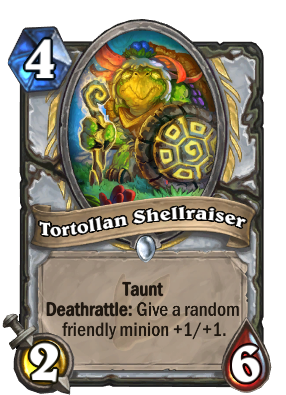 A Tortollan gardener's worst nightmare. 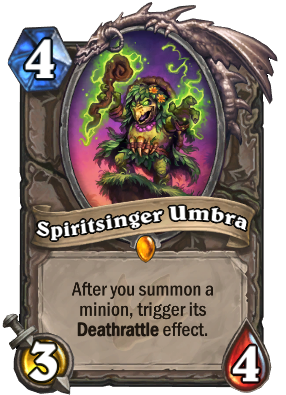 After you summon a minion, trigger its Deathrattle effect. 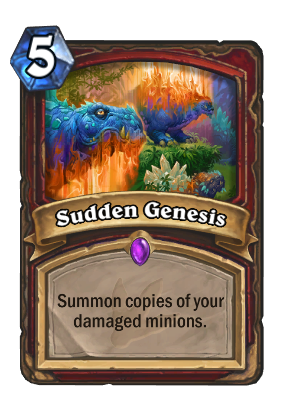 She sees the fate of anyone she meets, but it's always the same: dinosaur attack. 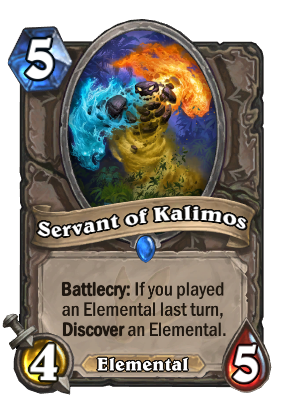 Explorers nicknamed him the Teapot Elemental. 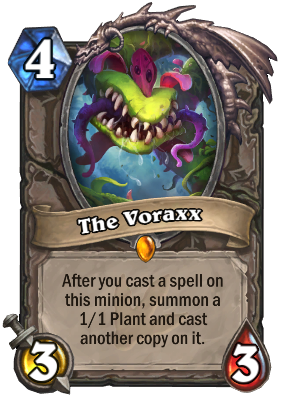 I am the Voraxx. 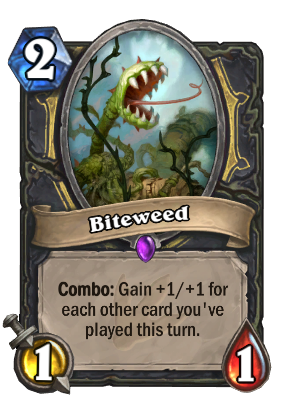 I speak for the weeds. A hero... In a half-shell. 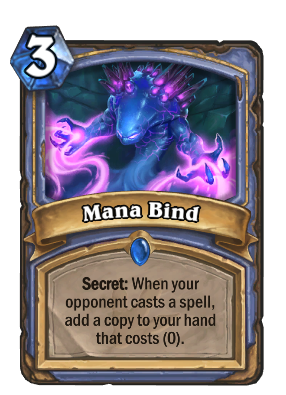 Secret: When your opponent casts a spell, add a copy to your hand that costs (0). 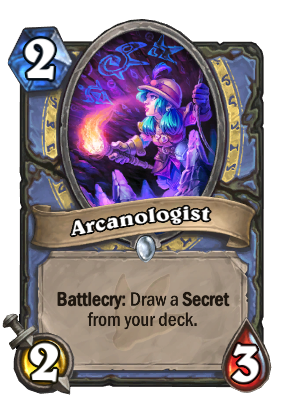 Draw a card, then add a copy of it to your hand. 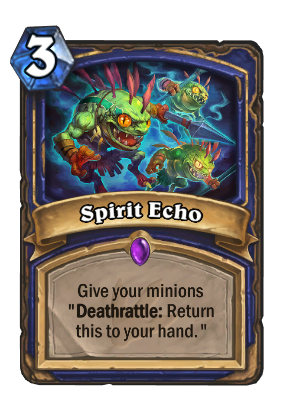 Give your minions "Deathrattle: Return this to your hand." 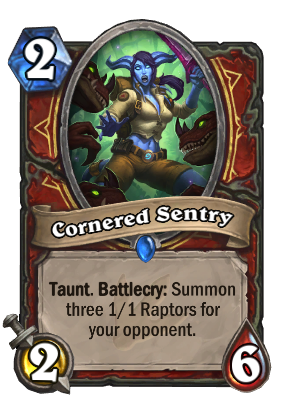 [x]Battlecry: Look at 3 cards. to get a copy of it. George promised to be good. 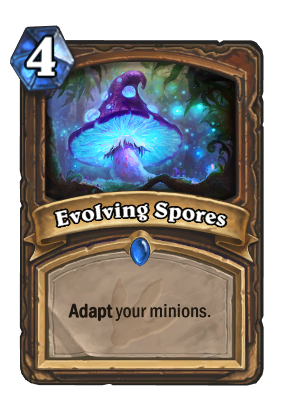 But it's easy for little Glimmerroots to forget. 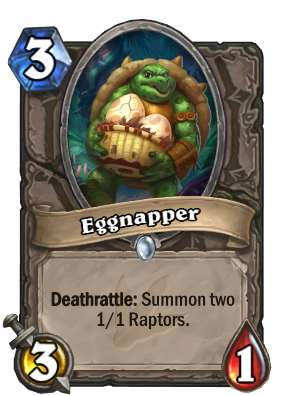 Deathrattle: Summon two 1/1 Raptors. Often misunderstood, it's just that he likes to use the eggs as pillows. 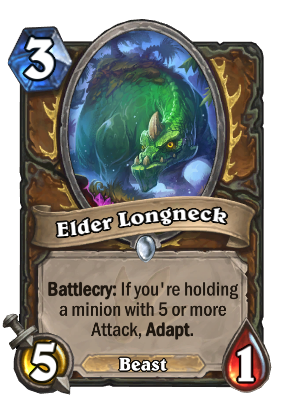 Battlecry: If you're holding a minion with 5 or more Attack, Adapt. 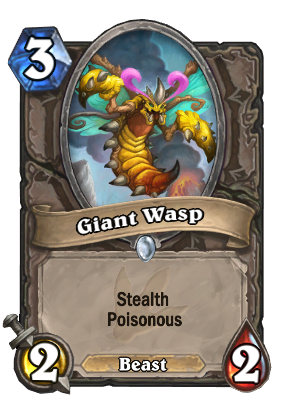 Float like a butterfly, sting like a giant wasp! 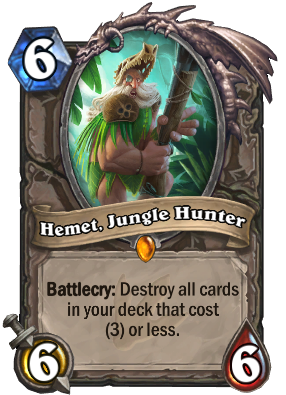 Battlecry: Destroy your opponent's weapon and gain Armor equal to its Attack. 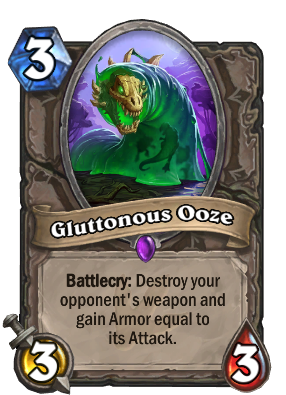 Three time winner of the Un'Goro weapon eating contest. NONE SHALL PASS until at least an hour after eating. 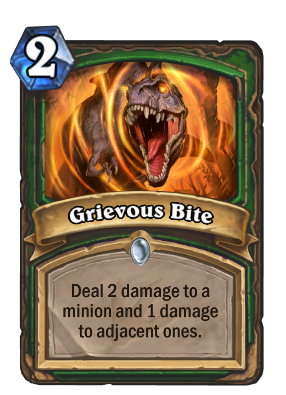 Loves goblins. In a light cream sauce. 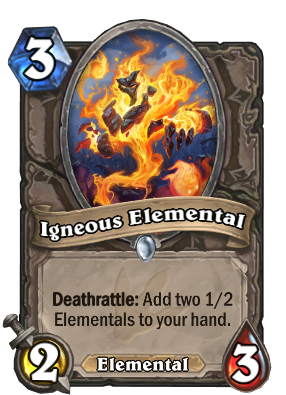 Deathrattle: Add two 1/2 Elementals to your hand. 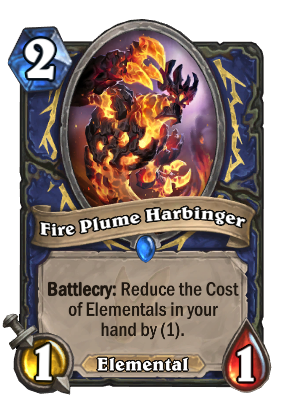 We wanted to name him "Ingenious Elemental", but he just wasn't that bright. 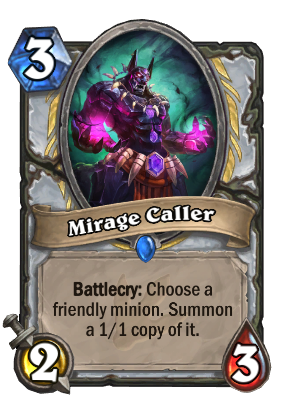 Battlecry: Choose a friendly minion. 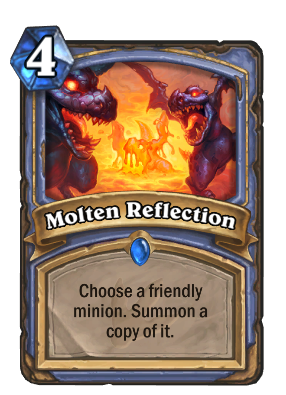 Summon a 1/1 copy of it. Mirage is actually the name of its long-lost cat. 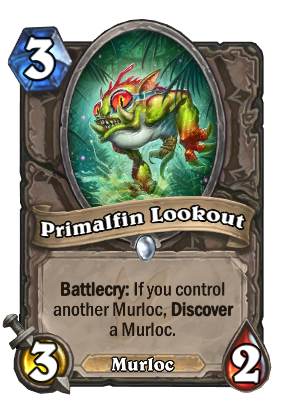 Battlecry: If you control another Murloc, Discover a Murloc. Lookout is a self-appointed title that's mostly an excuse to beat things up. Aww. So cute. 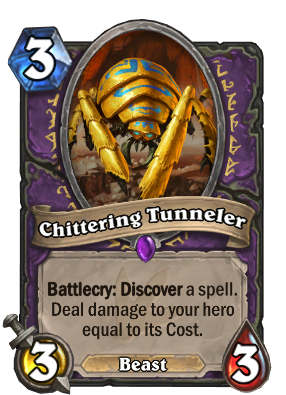 Want to feed him another finger? 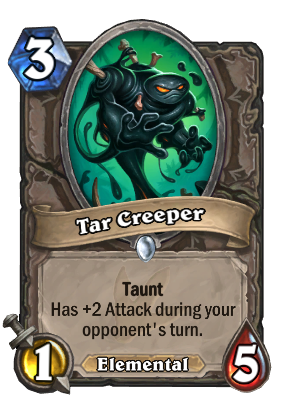 Battlecry: Discover a Taunt minion. 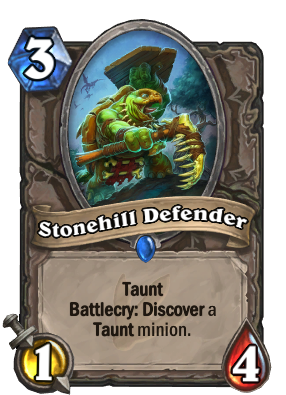 Briefly tried stand-up comedy under the name "Stonehill Offender", but turtles are just too thin-skinned. 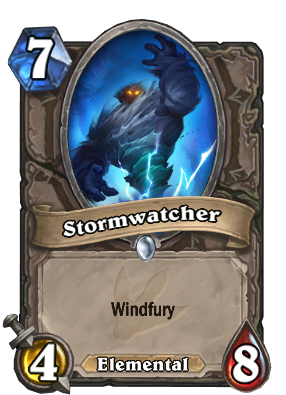 Has +2 Attack during your opponent's turn. 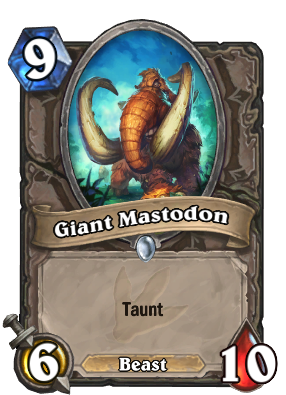 If you won't come to the tar pits, we'll bring them to you! 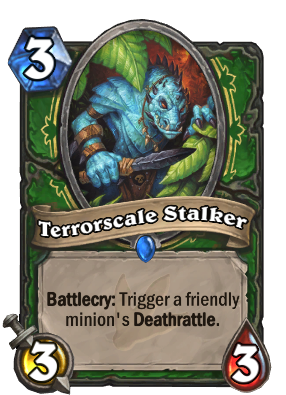 Battlecry: Trigger a friendly minion's Deathrattle. Likes to scare his friends half to death. 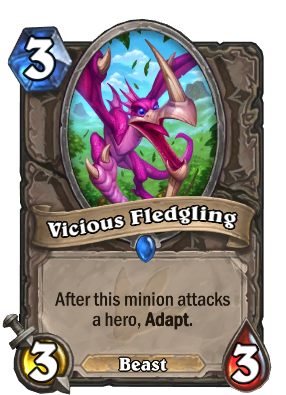 After this minion attacks a hero, Adapt. A youngster who is truly hungry for self-improvement. 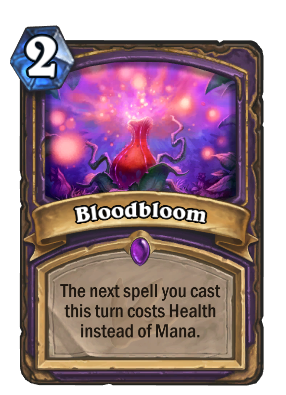 The next spell you cast this turn costs Health instead of Mana. Help save mana. Donate blood today! 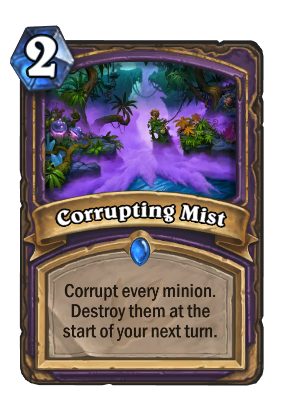 Corrupt every minion. 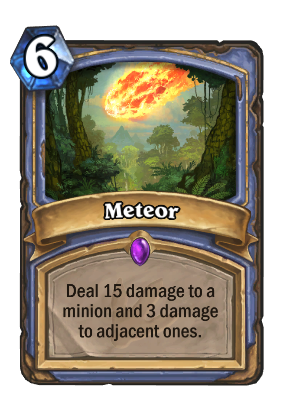 Destroy them at the start of your next turn. 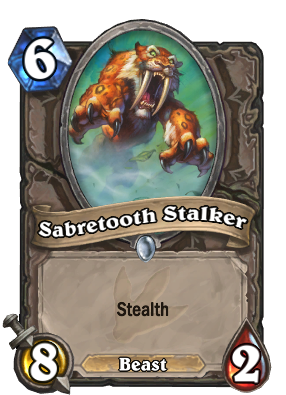 The most terrifying of Un’goro magics is both silent… AND deadly. 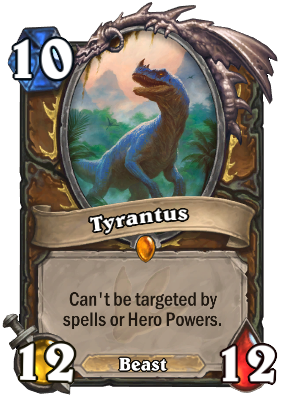 Anyone can dinomance. Just put your lips together and RAAWWWAARGGGH. 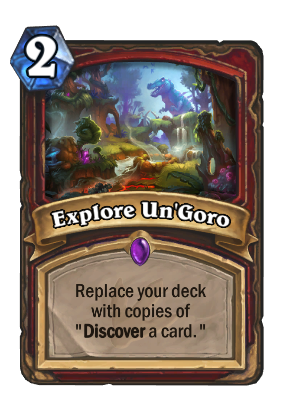 Replace your deck with copies of "Discover a card." 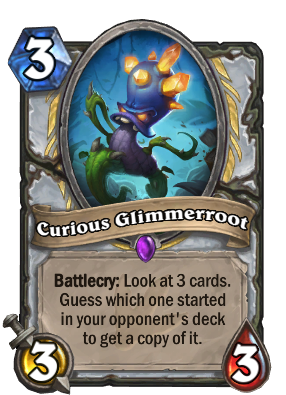 It turns out cards DO grow on trees! 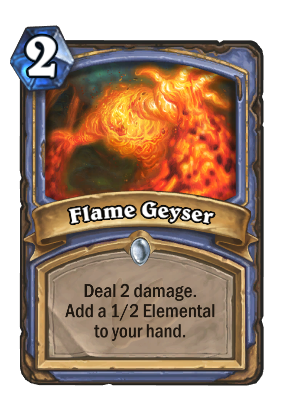 Add a 1/2 Elemental to your hand. 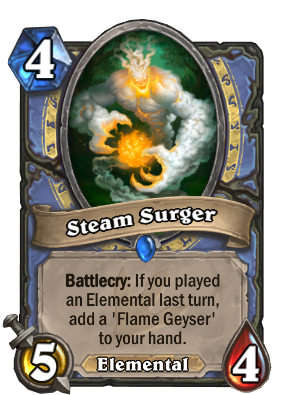 Oh, a wise geyser eh? 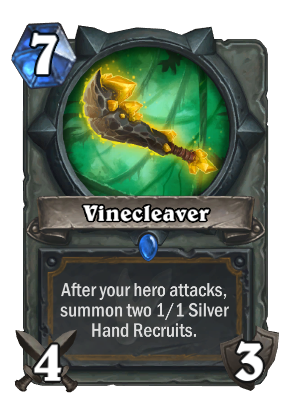 Deal 2 damage to a minion and 1 damage to adjacent ones. 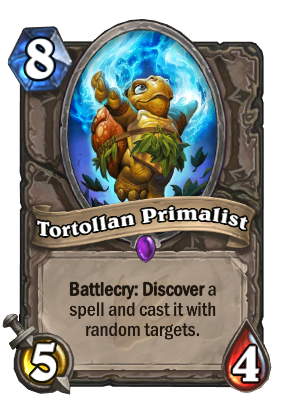 Discover a spell. 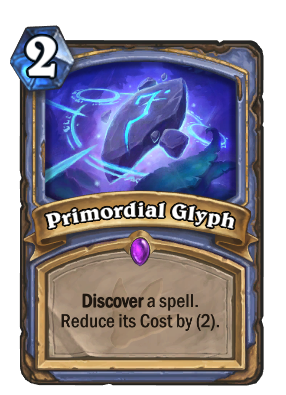 Reduce its Cost by (2). 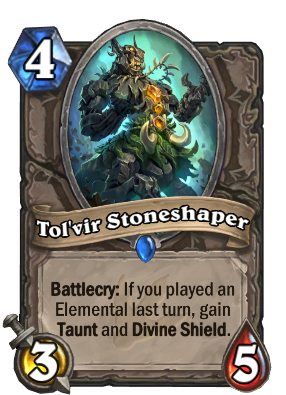 It's the Ancient Tol'vir symbol for "Whoops!" 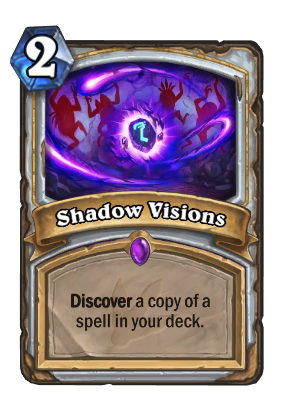 Discover a copy of a spell in your deck. This one’s a bird. And here’s a bunny! 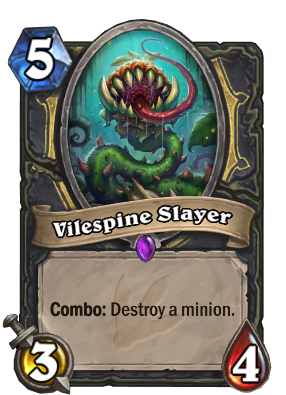 Combo: Gain +1/+1 for each other card you've played this turn. 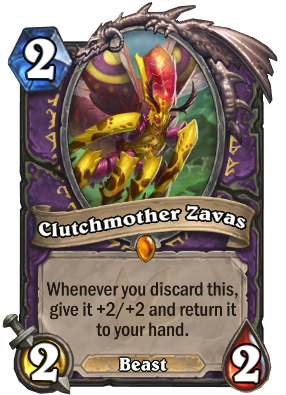 Whenever you discard this, give it +2/+2 and return it to your hand. A bit of a snob: still refuses to drive anything with automatic transmission. 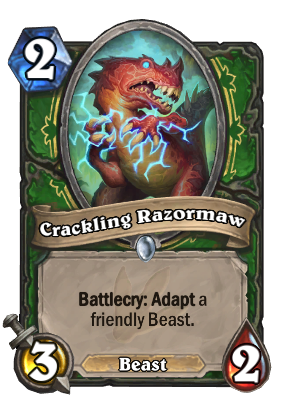 Battlecry: Adapt a friendly Beast. Wasn't clever enough to go AROUND the electric fence. 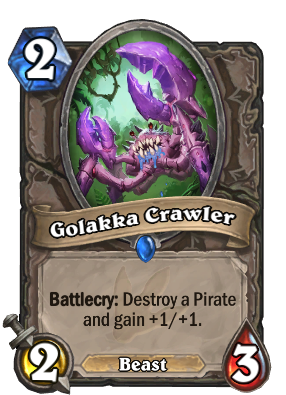 Battlecry: Destroy a Pirate and gain +1/+1. 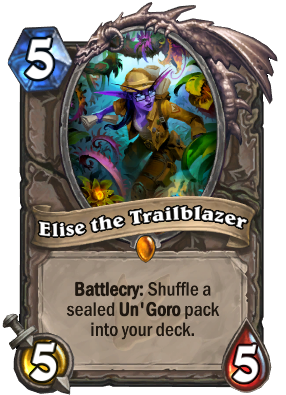 Universally adored by both control decks and ninjas. 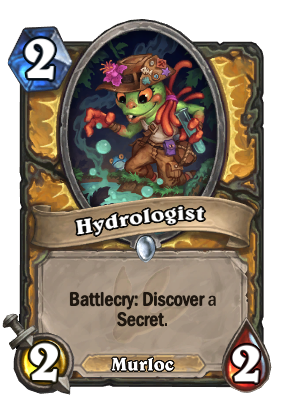 Murloc hydrologists are pretty rare. 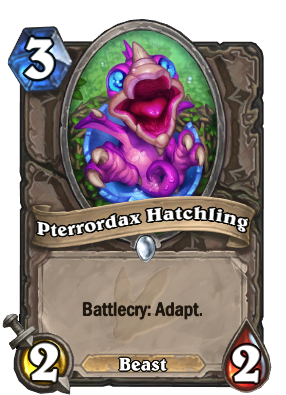 Most murloc undergrads pick computer science. 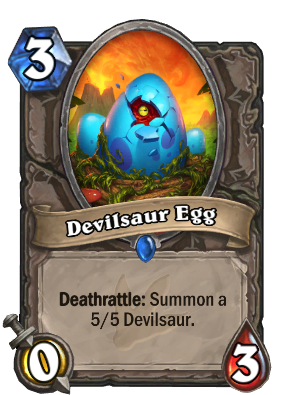 Deathrattle: Return any spells you cast on this minion to your hand. Sure, he'll return your stuff. OVER HIS DEAD BODY!